Don't forget to scroll all the way down! I had hoped to get this one posted a lot earlier, but here we are. This one's for you, Ma. When I was a kid, you couldn't find a photographer by simply doing an internet search or asking a fellow friend if they knew someone with a camera. Not every town was lucky enough to have a good resident photographer with a studio. If you wanted a nice, quality, family photo, there was one place you could go to with certainty to get one. Olan Mills. 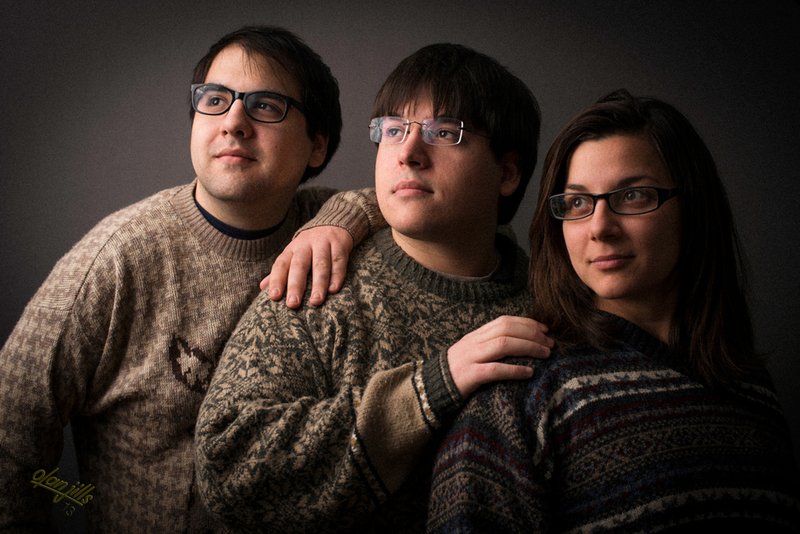 My mother took my brothers and I to Olan Mills on a number of occasions. Looking back, I'm glad she did and I understand why, but then it was hell. I hated dressing up (still do), hated getting my picture taken (still do), and I hated pretending like my brothers and I had some kind of cute, affectionate relationship for the camera for a 15-20 minute period of time (I love my brothers very much), and I'm pretty sure they felt the same way. On one such occasion, while the photographer was directing us from behind the camera, she said to one of my brothers, "Now, put your hand on sis's shoulder." It was b.s. and I wasn't falling for it. My brothers did not refer to me as "sis" and I most certainly would not have answered to it. You can see my doubt and disgust in the photo which was taken a millisecond after her brazen remark below. I'm not sure where the rest of the photo went, but my husband likes to keep this portion peering over the deck of small wooden ship on our bookshelf. "Put your hand on sis's shoulder." Smiley face! Sadly, I think that may have been the last time my mother took us to get our picture taken together. For years after that she would mention the idea periodically. As a mother myself now, I understand the desire to have photos of your children all together. Life is so transient. I'm lucky enough to be able to get nice photos of my kids whenever I want, but my mom didn't have that option. So, for Christmas this year, my brothers and I decided to rectify the situation. My mother deserved the photo of her children that she had been longing for all those years. With only 6 days until Christmas, making an appointment with Olan Mills would have been difficult, even if we knew where one was around here. So we did the next best thing. Olan Jills. (Afterword) The look on my mother's face was priceless when we gave her a framed print on Christmas Eve. Her expression went from confusion to appreciation, back to confusion, finally to realization, then an outburst of joy and delight. The first words she managed through her laughter were, "The sweaters?!"